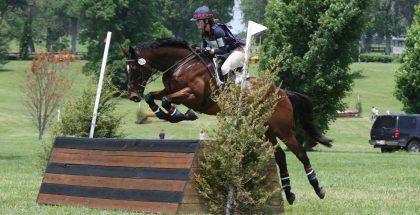 Michaela and Darla: an Eventful OTTB Story by Casey Laughter– Eventing is a huge sport, and the one of the most famous three-day eventing competitions in the United States is Rolex, held annually at the Kentucky Horse Park. Every year, thoroughbreds and other breeds compete in hopes of collecting prizes in the forms of entry to other competitions, prize money, and possibly even Olympic consideration. Darla, pictured above with Michaela, is out of a mare named Sister in Faith, a low level claimer, managing only six wins in 50 starts. However, Darla’s broodmare sire is Temperance Hill, the 1980 Belmont Stakes winner. However, Michaela Yowaiski and Darla are not on that level quite yet. The pair has been competing in individual and team events together since 2012. Michaela first visited the Kentucky Bluegrass of Lexington in 2011, when she attended the USPC (United States Pony Club) Festival, held at the Kentucky Horse Park. Michaela could see this is where she wanted to be, making the University of Kentucky the college Michaela set her heart on. It didn’t hurt that the University also offered an equine science degree, which is hard to come by. The college also offered an eventing team! 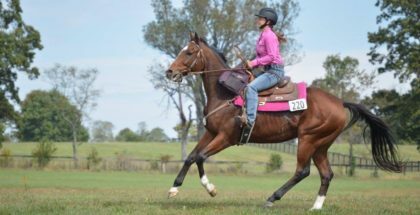 Michaela continued to train with her paint pony through the training level, but knew it was time to move up and find a new horse. The search began. One day, Michaela’s mother received a call from the secretary at a vet clinic who knew the family. 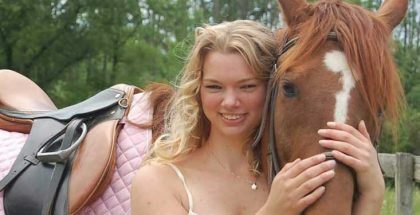 She knew of some thoroughbreds that could possibly be up to par with Michaela’s needs. Not many days later, Michaela was on her way to Middleburg, Virginia with her mother and a trainer named Tiffany Catledge. What Michaela did not expect was what she saw when Darla appeared before her for the first time. Darla was barely pushing 15.1 hands at the age of ten. With a raised eyebrow Michaela looked at her mother. Being there to try out some horses, Michaela couldn’t leave without at least riding Darla. 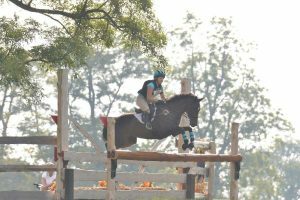 While not thinking much of the mare, Michaela was amazed when the mare jumped the test course with such ease and did everything else so effortlessly. 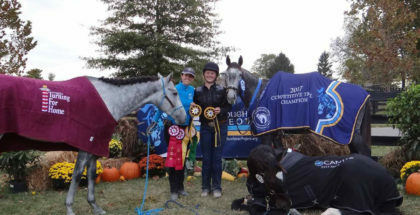 From the eventing record Michaela was able to find, Darla had only competed in one competition before Michaela purchased her. Not long after taking Darla home, Michaela and the mare competed in a training event, finishing second in their first event together, which stands as their best finish together. As for Darla, the mare is now 14 and comes from a good pedigree. She is sired by Burbank, a multiple stakes winner on the turf, running consistently at middle distances. Burbank is a son of Wild Again. Darla is out of a mare named Sister in Faith, a low level claimer, managing only six wins in 50 starts. However, Darla’s broodmare sire is Temperance Hill, the 1980 Belmont Stakes winner. The stallion also won the 1980 Travers, Jockey Club Gold Cup, and Super Derby. In 1980, he was voted Champion 3-Year-Old. Darla’s distaff line traces back to Man O’ War in the 6th generation of her pedigree through War Admiral. Darla is still a high-strung mare who wants to go and continue going until Michaela tires her out. For now, the pair continues to train and compete, hoping to have a better half of 2016 than the beginning. Michaela hopes to compete in 2-star events this year. The pair has not yet competed at this level.